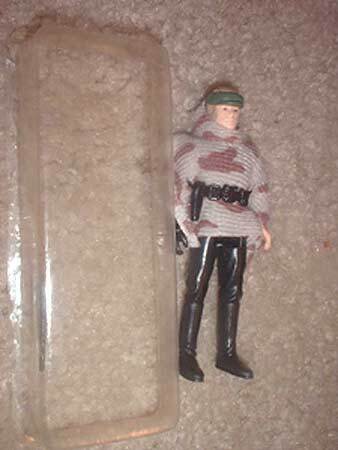 Here we see a nice POTF carded sample, which is believed to have been used for display purposes in the Toy Fair Kenner showroom. A number of striking differences exist in this piece compared to a production carded figure. First, it should be immediately obvious by the card's square bottom corners that it is a proof card. Samples of this nature are often comprised of a proof card with a hand applied bubble, two characteristics that are definitely present on this piece. Aside from the character's produced status and the figure's production stage, it is highly reminiscent of the widely publicized unproduced POTF carded samples featured in the 1985 Toy Fair catalog by sharing similar card and bubble characteristics. This second picture highlights an interesting aspect of the bubble construction. While the production carded figures exhibit one piece bubbles to hold the coin and figure, this carded sample features a seperate bubble for both the coin and figure. As you can see, time has taken its toll on the adhesive material allowing the figure bubble to seperate from the card. Here we see a close-up showing the gun which accompanies the figure. 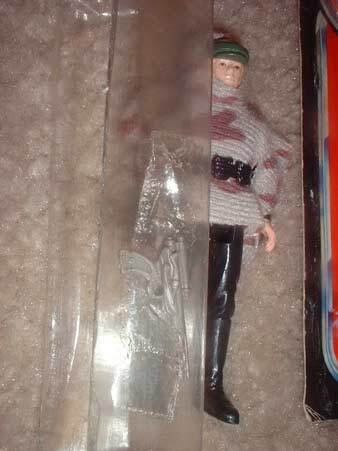 Luke Poncho came with the same gun as Luke Jedi with the exception of the color being much darker on Luke Poncho's version. 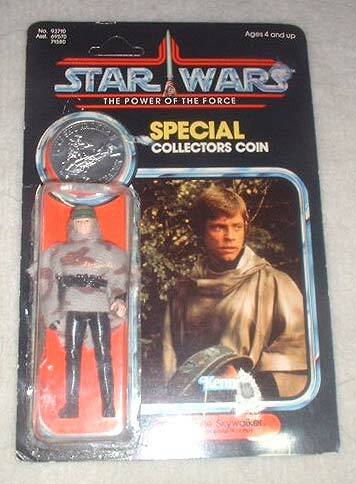 The lighter coloring here potentially indicates they simply used the Luke Jedi gun for inclusion in this mock-up. 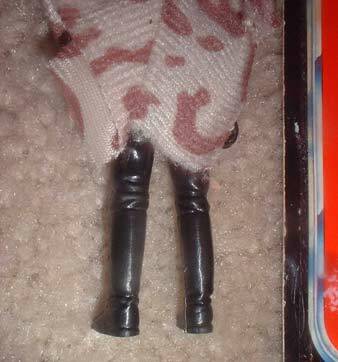 Finally, by looking at the figure's legs it becomes apparent the figure is a first shot as evidenced by the absense of copyright information. The myriad of unique characteristics present on this prototype makes it an extremely significant item.